Degree of reduction in the TEK signal (A = 100 percent; B = 50 percent; C = 0 percent) determines degree of defect in the major vessel that drains the front of the eye (white structure). Patients with only 50 percent of the TEK signal are at risk of developing glaucoma due to high pressure in the eye leading to damage of the optic nerve. The yellow arrows show gaps in the canal. Northwestern Medicine and University of Wisconsin-Madison (UW) scientists have identified a gene that causes severe glaucoma in children. The finding, published in The Journal of Clinical Investigation, validates a similar discovery made by the scientists in mice two years ago and suggests a target for future therapies to treat the devastating eye disease that currently has no cure. “This work shows us how a genetic mutation causes a severe form of glaucoma called primary congenital glaucoma, which afflicts a significant portion of children enrolled in institutions for the blind worldwide,” said principal investigator Susan Quaggin, MD, chief of Nephrology and Hypertension. The gene, TEK, is involved in the development of a vessel in the eye called Schlemm’s canal, which drains fluid from the anterior portion of the eye. In glaucoma, this vessel can be defective or missing, creating pressure buildup that can damage the optic nerve and cause vision loss. In previous research, Quaggin’s lab showed that deleting the gene in mouse models led to glaucoma, but the scientists didn’t know how mutations impairing the gene affected humans. After publishing that research, Quaggin met Terri Young, MD, a pediatric ophthalmologist and chair of Opthalmology at the UW. Young had identified mutations in TEK in some of her patients, but didn’t know the significance. 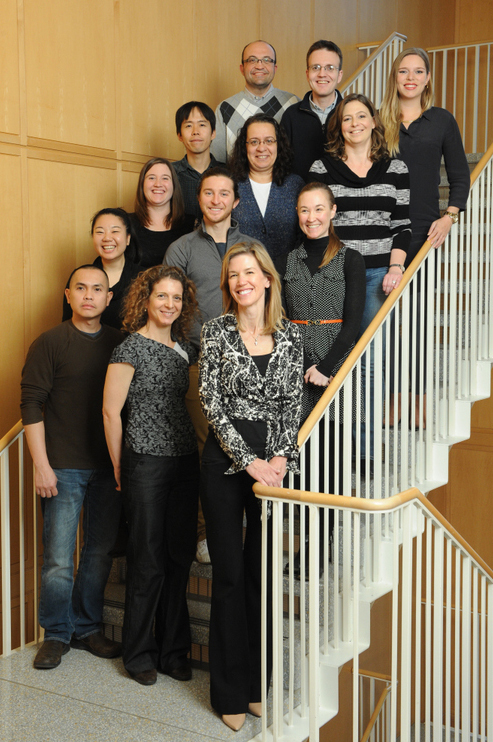 (Front right) Susan Quaggin, MD, chief of Nephrology and Hypertension, Charles Horace Mayo Professor of Medicine and director of the Feinberg Cardiovascular Research Institute, and members of her lab led the new research together with scientists at the University of Wisconsin. Altogether, the team found TEK mutations in 10 unrelated families with children who have primary congenital glaucoma. All of these children did not have mutations in other genes known to cause glaucoma. The scientists then demonstrated that the TEK mutations identified in children impair the vascular signaling pathway important in Schlemm’s canal formation – the same way they do in mice. Findings made in animal models do not always translate to patients, but it appears that this important eye vessel functions very similarly in mice and humans. In ongoing research, Quaggin’s group is developing an eye drop that repairs the TEK pathway to fix the faulty vessel. The scientists are also exploring whether TEK pathway mutations play a role in adult-onset glaucoma. Quaggin is the Charles Horace Mayo Professor of Medicine and director of the Feinberg Cardiovascular Research Institute (FCVRI). She was also recently named a councilor for the American Society of Nephrology, a prestigious position that will extend until 2022 and transition into a role as president of the organization. Additional Feinberg study authors include first author Tomokazu Souma, MD, PhD, research assistant professor of Medicine in Nephrology, Benjamin Thomson, PhD, Shinji Yamaguchi, PhD, Liang Feng, Xiaorong Liu, PhD, assistant professor or Ophthalmology, and Jing Jin, MD, PhD, assistant professor of Medicine in Nephrology. This study was funded by National Institutes of Health (NIH) grants R01 HL124120, R01 EY014685 and EY11721, the Research to Prevent Blindness Inc. Lew R. Wasserman Award, the Duke–National University of Singapore Core Grant, the University of Wisconsin Centennial Scholars Award and NIH Career Development Award K12 1K23EY020554. This work was also supported by grants from the March of Dimes Foundation, Howard Hughes Medical Center, Ophthalmic Research Institute of Australia, Channel Seven Children’s Research Foundation, Department of Innovation, Industry, Science and Research, and the National Health and Medical Research Council of Australia.